Not your basic gear bag. Our's has an easy access top pocket that is perfect for the items you will need in a hurry or on a daily basis. This pocket cover zips off completely making it easy to decorate with your department patch, logo or personalization. Two of the pockets in the front have flaps to keep items contained or you can tuck the flaps in for easier access. Four Velcro® straps on the top holds your PR24, and there are also four individual pouches that Velcro® to the inside of the bag. These pouches are clear on one side for easy viewing. Not only does the deluxe gear bag have these added features it has five other pockets, rigid walls and a moveable inside divider. 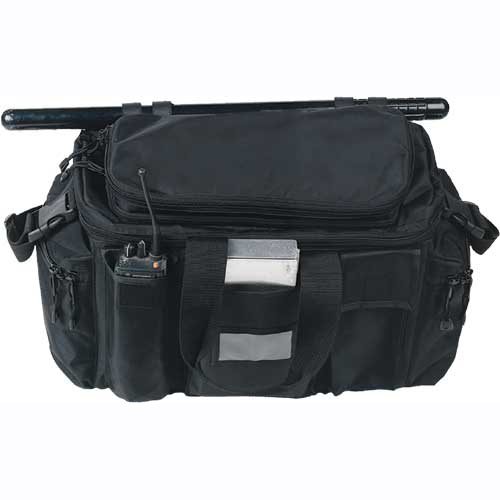 It is made of Ballistic 840 Denier Nylon with a PVC lining making it easy to clean, water-resistant and comes with a padded non-slip shoulder strap. Sized for all your gear at 18 1/2" L x 7 1/2" W x 12" H.
This is the perfect bag to fit all of your gear. Click here to see more features of this bag.